Style: Mobile Single Wide "Mobile (owned lot)"
Garage: "Garage: No Garage; Parking Space(s): 5"
QUIET AFFORDABLE NEW ACREAGE OPPORTUNITY. This property is located on a very quiet road in a mixed wooded/pasture area west of Saskatoon. It is only a 15 minute drive to SaskTel Centre or the West side Walmart. 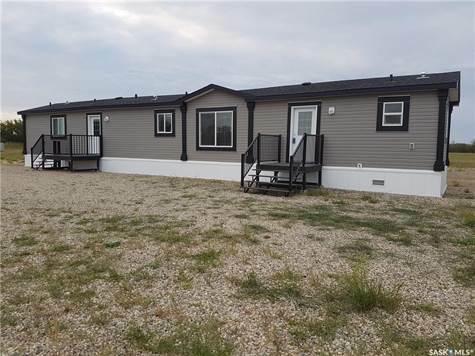 This newer (August 2016) well-designed open floor plan modular home has 1216 square feet and includes 3 bedrooms, 2 full bathrooms, central heating and air conditioning, large windows and many upgrades. All appliances are included. The land has abundant water with an excellent high quality water treatment system included. Plenty of room to build a shop, a garage or anything else to enjoy your country lifestyle. More land is available if required.